CARLY FIORINA EXCLUSIVE! If everybody else had these stories they wouldn't be exclusive. MAD MAX - KID TABLE Furious over their scenes being left on the cutting room floor two underemployed movie extras and a Hollywood stuntman steal a truck full of Oscar nominated movie props and memorabilia and head for an abandoned travel trailer hideout on ten acres of desert land near Lake Los Angeles in the Antelope Valley. 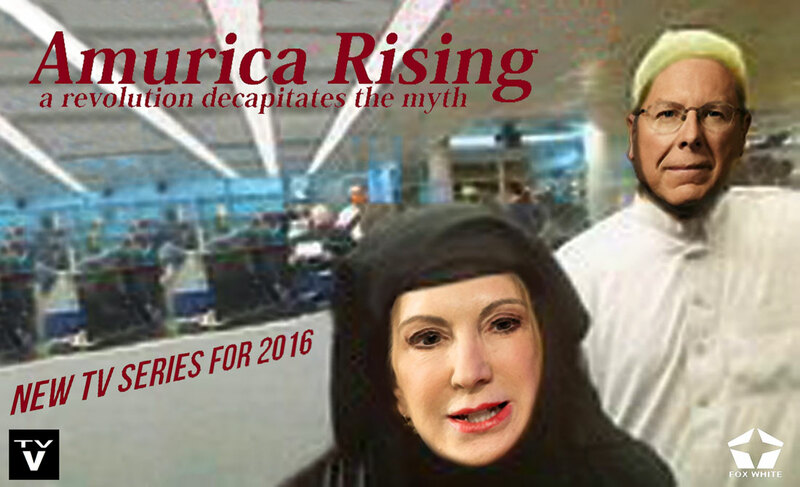 AMURICA RISING Terrorist supporting business trained CEO's enter the United States to seek out opportunities to cause massive damage. In short order one nearly destroys an information technology company costing 30,000 middle class jobs while the other helps dismantle hundreds of local gun laws in order to enable future terrorists. GOP SURVIVOR ISLAND 2016 Survivor Island for 2016 Republican candidates is the luxurious Lighthouse Bay Resort where "survival" conditions normally go for $2400 per night. Still after several days on the island paradise all the men begin to bond while Carly Fiorina somehow becomes less appealing with every bitter diatribe she spews. 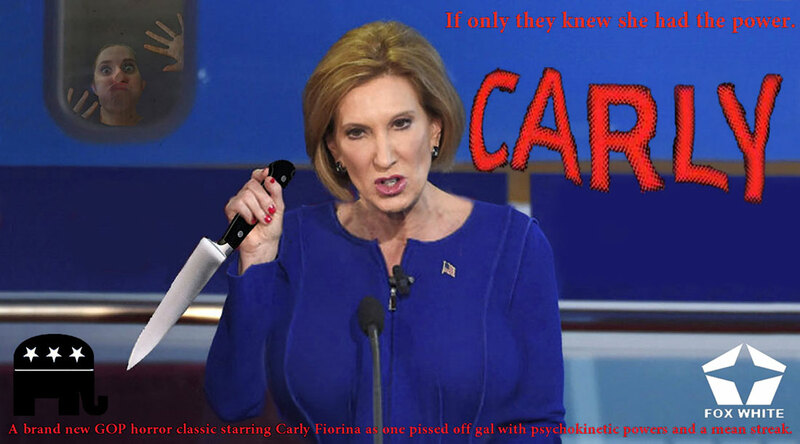 PULP FICTION 2 Starring Carly Fiorina, Ted Cruz and Ben Carson. Like the original this film connects intersecting storylines, an unconventional style and frequent use of homage and pastiche. Unlike the original this black comedy lacks comedy and will never make any all-time favorites list. TV Guido wrote "jokes as flat as week-old pizza". CARLY Inspired by the horror classic CARRIE this movie is far more terrifying. Carrie was a picked-on teenager but Carly is a mature bitter woman who was humiliated by an old boys club and fired as a CEO of a major corporation. 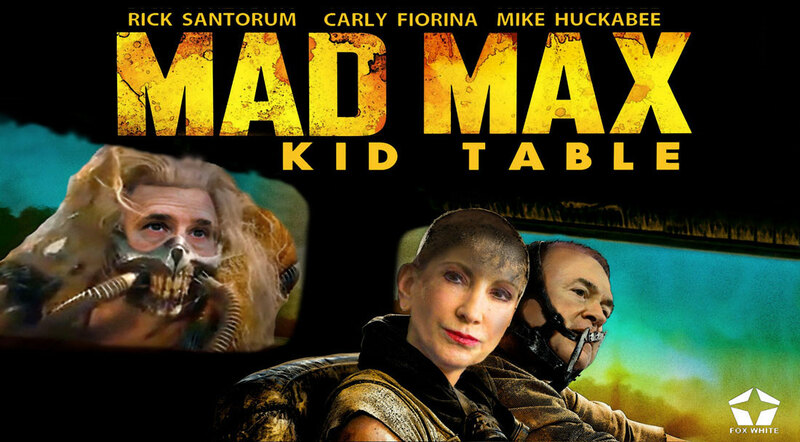 Unable to land a job since Carly wants a nuclear arsenal to wipe 3 billion men off the face of the earth. 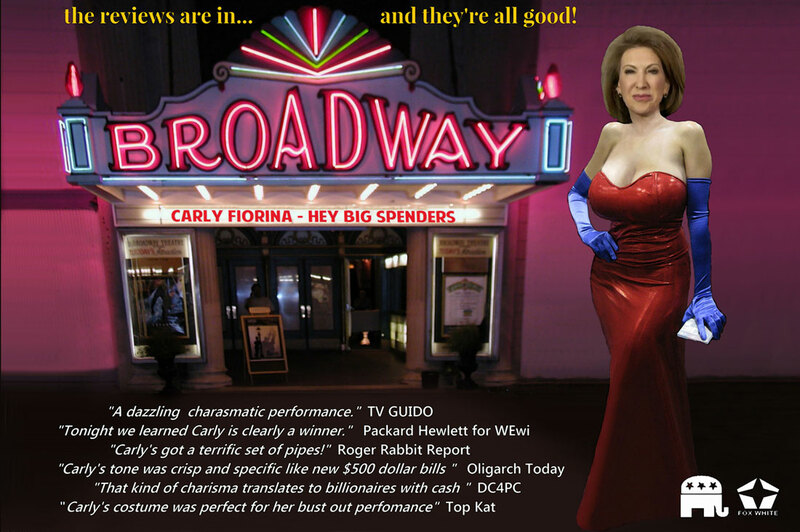 CARLY FIORINA - HEY BIG SPENDERS Hoping to persuade a billionaire backer to become her angel and back a continued run of her show Carly Fiorina pulled out all the stops in her bust out performance attended by video technicians recording the event for a later viewing by selected billionaires at an uptown billionaires cigar club meeting. RAGE IN A CAGE Wrestling, UFC and all forms of simulated combat are in. Rage is the latest rage and the FOX empire knows exactly how to provoke outrage that builds into more and more raging viewers. By staging cage matches that are part debate part kickboxing and part wrestling this event is certain to appeal to the base. 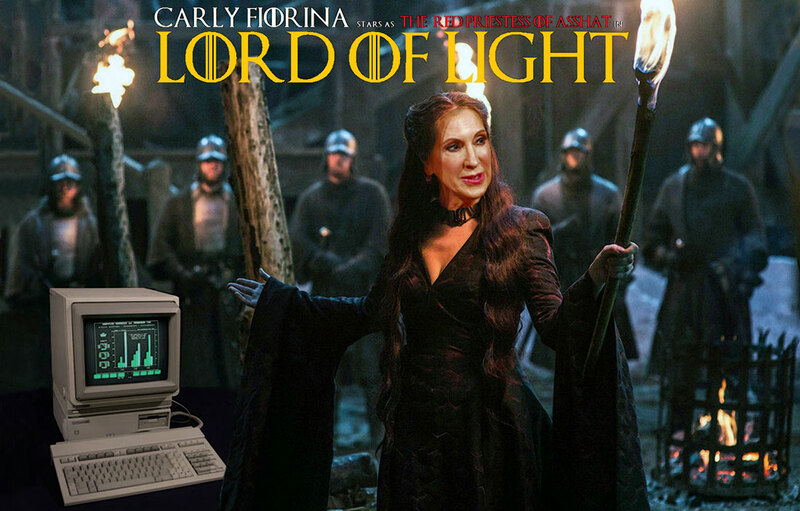 LORD OF LIGHT Carly Fiorina gives acting a try in this GAME OF THRONES spinoff movie. The Red Priestess of Asshat offers proof of the Lord of Light to the skeptical bannermen of King Stannis. She claims in hushed tones that the box she calls HP-150 is a magical and blessed connector to her Lord and must be protected at all costs. RED STATE PIANO Is this another Music Man? No. But they got trouble with a capital T in River City, Indiana. After the legislature legalizes discrimination against gays and lesbians in Indiana an amazing majority of big name recording artists suddenly cancel all concerts and appearances in the state. The Indiana State Fair is left without any performers until Governor Mike Pence comes to the apparent rescue. 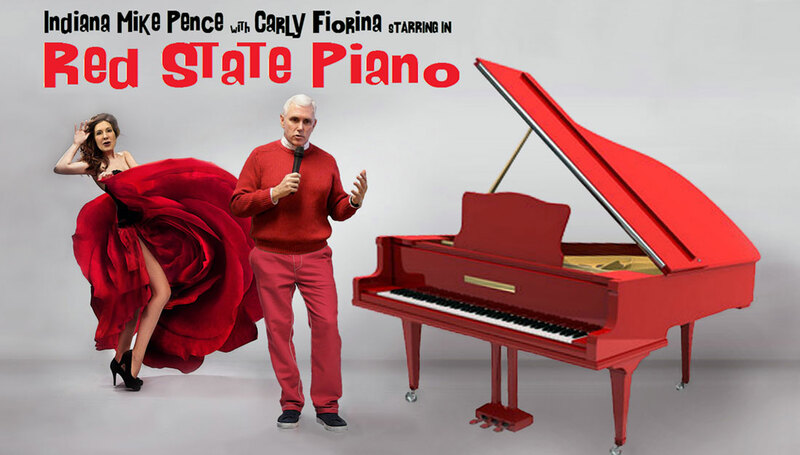 Mike is a big fan of Pat Boone and knows all his songs so he calls his friend Carly Fiorina who can carry a tune to help out with harmony and 90 minutes later their show biz career is born. Things seem to be going well until a flaming bag of horse poop is tossed on stage.